McKale Center was built from 1970-73 for a total cost of $8.1 million. TUCSON, Ariz. — Arizona athletic director Greg Byrne said one of the first times he had been to McKale Center was 1987, and when he arrived for his current position four years ago, one of the first things he thought was "it looks very similar." And not in a good way. Like many of the sports facilities at the University of Arizona, McKale Center has long needed a facelift. Built from 1970-73 for a cost of $8.1 million, the building will finally see the first stages of its upgrades in the coming weeks when Arizona will debut of its state-of-the-art, high-definition scoreboards (four 12-foot-by-19-foot display boards), which cover 25 percent more space than the current one. Those are scheduled to debut for the start of Pac-12 play next month. Miller said the project "is a big step up for us in our facilities in where we operate on a day-to-day basis," Byrne said. Arizona president Dr. Ann Hart called McKale Center "an iconic building, but being iconic could be a compliment or it can be a little bit of a problem. 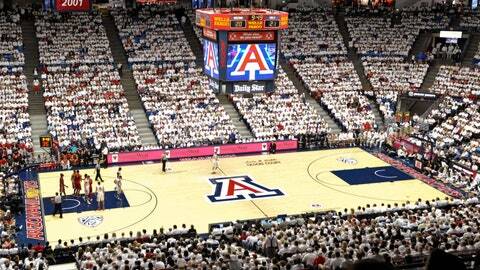 We want McKale to be an iconic building with a new facelift." The remaining projects for the initial phase of renovations will begin in May 2014 and be concluded the next year. They will include new seating and a new playing floor; a proposed new concourse could come later. UA announced at a press conference on Monday afternoon the school has received $12.5 million in pledges, including $6 million from Tucsonans Cole and Jeannie Davis, to help pay for the projects, which could eventually cost $80 million. The first phase of the project is expected to cost $30 million. Byrne said there are ongoing discussions that could bring another $20 million from donors in the coming weeks. "Knowing how much our men’s basketball program, especially, (but) all our sports are to all of us in what we do," Byrne said, "we knew we had to take those next steps. I know it was one of the first things we (Sean Miller and Byrne) talked about and when Dr. Hart came to town that was one of the first things I talked to her, about the importance of this project." Byrne said he visited about a handful of newly renovated arenas to get some ideas for a newer, fresher McKale Center. He called the new look — more red and blue and the removal of the upper-deck yellow seats — an "exciting time for the athletic department and the basketball programs." The Davises’ donation of $6 million is "what got the ball rolling." The family has now given $10 million in total through the years. "During our introductions," Cole Davis said, "Jeannie and I were so impressed with Sean Miller and his vision for where Arizona basketball was headed. Now, four years later, we’ve seen the results of that vision, and we’re excited about supporting a program that can compete for championships." Davis added that he and his wife like winning, and in that regard, the refurbished McKale Center will help not just men’s basketball but a number of sports. Seating capacity, meanwhile, is expected to remain about 14,500. In time, Byrne said, the construction might include an enclosure to an outside concourse, but it’s too early to tell if that will happen; it would cost about $40 million. For now, the first phase will feature new blue, padded seats, a newer-looking student section (Zona Zoo), where red seats will include a designed "A," and a few fan amenities that will include concession stands and more restrooms. "Here in phase one, we will greatly and positively affect the fan experience and do the same for the student-athletes," Byrne said. When Miller and Byrne were visiting various venues to gather ideas, Miller told Byrne about facilities needing "to pop" to get the attention of today’s potential recruits. Byrne said he’s confident "you’re going to see that with the new seating. It will have that flavor right away." Miller said even the new scoreboards help with the scenery because they’ll "make the arena a lot different." Cole Davis, looking at the bigger picture, said he’s excited about the future of the program and is optimistic Miller "will take the program where we’ve never seen it before, and that’s a tall order."